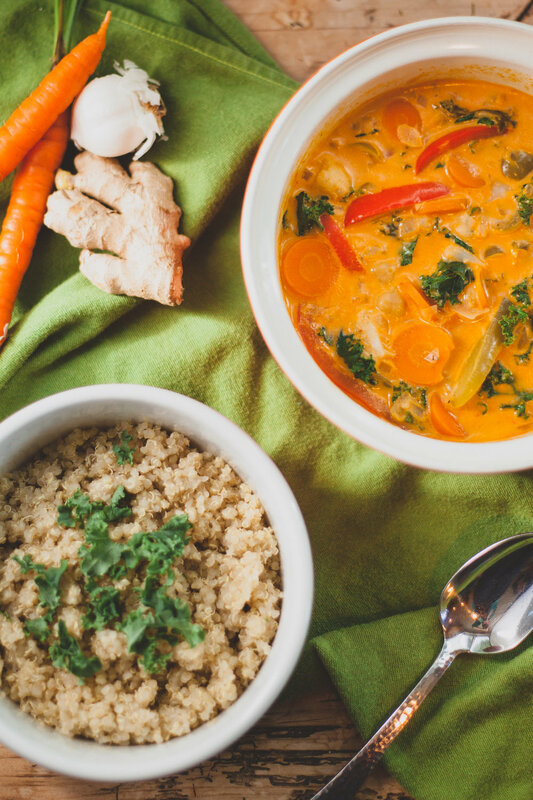 This recipe leaves you feeling full and satisfied, and your body will be so happy inside! 4 carrots, sliced into thin circles. Chop the onion into small pieces, chop the kale and cauliflower, and slice the carrots and bell peppers. Place the cauliflower in a steamer, and cook until tender. Begin cooking the quinoa according to instructions. While the cauliflower and quinoa are cooking, in a large pan or pot, sauté the garlic, ginger, and onions in olive oil over medium heat for 3 minutes. Add the bell pepper and carrots, and continue to cook until tender (about 10 minutes). Once the bell pepper, carrots, and onion are tender, add 1 Tbs. of the red curry paste, drained chickpeas, soy sauce, and lime juice. Continue to cook over medium-low heat for 3-5 minutes.